According to the brand-new countdown widget that now appears at BlackbirdsNovel.com, there are 38 days left until the publication of In the Shadow of Blackbirds! 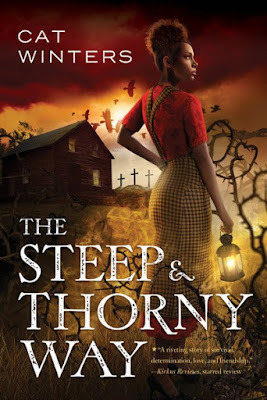 Because April 2 is getting so close, you'll more than likely see me and my novel, as well as several giveaways involving the novel, showing up across the Web. 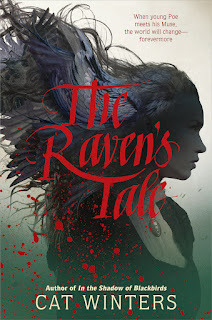 Realm of Fiction: An interview with me that involves fairy photos and flu remedies, plus an international ARC giveaway. 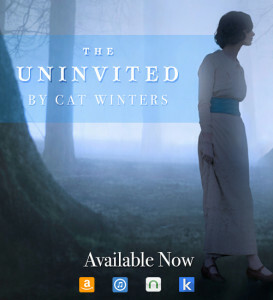 The Young Adult Connection: Guest post ("Why YA?") and an international In the Shadow of Blackbirds charm bracelet giveaway. Book, Bones, & Buffy: Preorder copy giveaway (international), part of the YA Paranormal Hop. The Lucky 13s: We debut kidlit authors are sharing our childhood and teen photos. 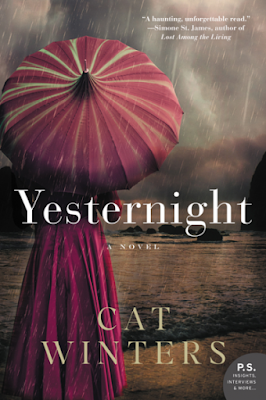 See me when I was about six months older than my protagonist, Mary Shelley Black. Book Trailer Release Tour: Five ARCs and a free download of Jill Tracy's "Under the Fate of the Blue Moon" are still up for grabs (U.S. and Canada only). Publishers Weekly Children's Bookshelf: The publication's starred review of In the Shadow of Blackbirds showed up as one of the featured reviews. Blogger/librarian reviews are also starting to appear online. Here's a small sampling (the last review contains several passages from the book, so you can get a taste of the novel's prose). Thanks to everyone who's helping to spread the world about In the Shadow of Blackbirds! I greatly appreciate your time and enthusiasm! Gabrielle at The Mod Podge Bookshelf hosted the exclusive In the Shadow of Blackbirds book trailer reveal on Valentine's Day. In case you missed it, here's the trailer, with music by the talented Jill Tracy. There's still a chance to win a signed advance reading copy of In the Shadow of Blackbirds, as well as a free MP3 download of the book trailer's song, "Under the Fate of the Blue Moon." Head to my post about the Trailer Reveal Tour & Giveaway for details. It's my book trailer reveal day! Head over to The Mod Podge Bookshelf for an exclusive look at the video, enter the giveaway, and then come back here to learn about the song featured in the trailer: "Under the Fate of the Blue Moon" by Jill Tracy. 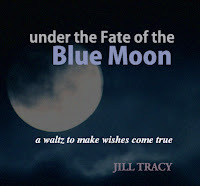 This dreamily enchanting piece by Jill Tracy is a "waltz to make wishes come true." (Composed on the rare Blue Moon New Year and recorded the night of the total Lunar Eclipse Solstice, Dec 20, 2010.) Make a wish while listening and be lured by its haunting spell. Jill Tracy will transport you into a seductive and magical realm far beyond the Everyday. The place where we wished we lived. A dark, elegant netherworld full of hidden passageways, wonder cabinets, and opium dens. Of monsters, marvels and mayhem. You know it’s not safe here; but with Jill Tracy as your guide, you’ll be in no hurry to leave. 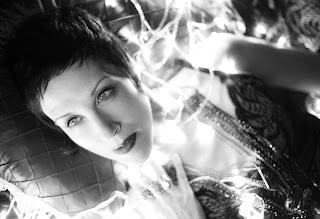 The San Francisco-based singer/pianist/storyteller and “musical evocateur” has garnered multiple awards and a passionate following for her eerie and beautiful cinematic music, sophisticated lyrics, old-world glamour, and curious passion for strange tales. Visit Jill Tracy at www.jilltracy.com. For more information about In the Shadow of Blackbirds, visit the new website for the novel, BlackbirdsNovel.com. Publishers Weekly's Starred Review of "Deliciously Creepy" IN THE SHADOW OF BLACKBIRDS! 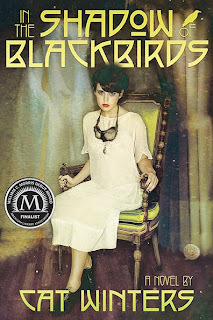 I've already been sharing the news at Twitter, Facebook, and BlackbirdsNovel.com, so please forgive me if you already heard my announcement earlier today: Publishers Weekly gave In the Shadow of Blackbirds a starred review! Major review publications like Kirkus and Publishers Weekly place a single star next to the reviews of the books they particularly liked. Whether a starred review for In the Shadow of Blackbirds will help its sales after its April 2 release date remains to be seen, but I'm thrilled to pieces that the book received such an honor! For the full review, please visit publishersweekly.com. 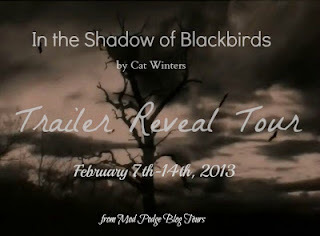 In other news, the In the Shadow of Blackbirds trailer reveal tour and giveaway is still going strong. Click here for the latest stops. The actual book trailer reveal will take place this Thursday (Valentine's Day) at The Mod Podge Bookshelf. Book Trailer Reveal Tour & Giveaway Is Now Up and Running! We've been having some technical difficulties with the giveaway portion of the In the Shadow of Blackbirds Trailer Reveal Tour and Giveaway, but it looks like it's working today. The event is hosted by Mod Podge Blog Tours, a site that will also be hosting the exclusive reveal of the In the Shadow of Blackbirds book trailer this Valentine's Day. I'm thrilled to announce that the first major In the Shadow of Blackbirds review came in...and it's a good one! "Winters strikes just the right balance between history and ghost story, neatly capturing the tenor of the times, as growing scientific inquiry collided with heightened spiritualist curiosity. Vintage photographs contribute to the authenticity of the atmospheric and nicely paced storytelling." 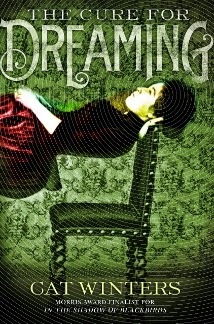 The full review is located at kirkusreviews.com, although it's currently available through subscription only. I believe it will be available to everyone after the publication of the March 1 printed issue.